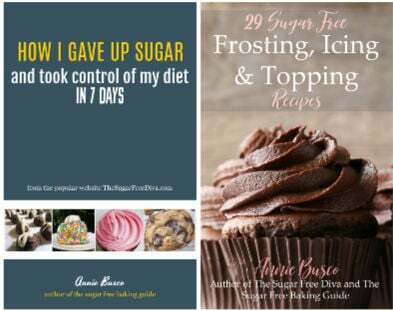 This is for those of us who really need to know How To Make Sugar Free Ganache . Because, there really is so much that you can do with this chocolate goodness!! The perfect complement of chocolate for just about any dessert. This is a need to know recipe for so many reasons as well! There is a difference between chocolate ganache and chocolate sauce. You probably already knew that there is a difference between the ganache and sauce. However, in case you do not, I will tell you that they both have their purpose. Ganache really is a multi-purpose use for chocolate. What I mean is that there are a lot of uses for ganache. Certainly, you could easily use your sugar free chocolate ganache as a sauce. However, there are other uses for ganache beyond using it as a sauce. Chocolate ganache makes for a great tasting chocolate dip for about anything from strawberries to cookies. But, you could also use your sugar free ganache as an icing, a glaze, or even as a filling in your favorite homemade pastry! What makes ganache so special is the blending of chocolate and dairy. For starters, we will use Sugar Free Semi Sweet Chocolate Chips in this recipe. Sugar Free Semi Sweet Chocolate chips have that great chocolate taste but, with a bit of sweetness added to the recipe. Another important ingredient in Sugar Free Ganache is the heavy cream. The heavy cream (heavy whipping cream) is thick and rich in fat. In fact, it is the fat that has been skimmed off from fresh milk. You could use a substitute for heavy cream such as half and half with butter. But, you may need to make some adjustments along the way. Here are a few ideas that you can use with your ganache. Give your ganache a ‘kick’ by adding a teaspoon of instant coffee granules. Better yet, add a teaspoon (or up to a tablespoon) of your favorite liquor or extract (vanilla, orange, mint, etc.). Make your sugar ganache even thicker (frosting) by adding extra chocolate chips. Or, you can thin out your ganache by adding less chocolate. Pour the ganache while is warm or add a bit of butter to make it shine more. Also, if you make too much ganache, you can freeze it for about a month and use it later. As you can tell, there is a lot that you can do with sugar free chocolate ganache. Altering the amount of the chocolate that you add to the recipe can certainly increase the uses that are available. 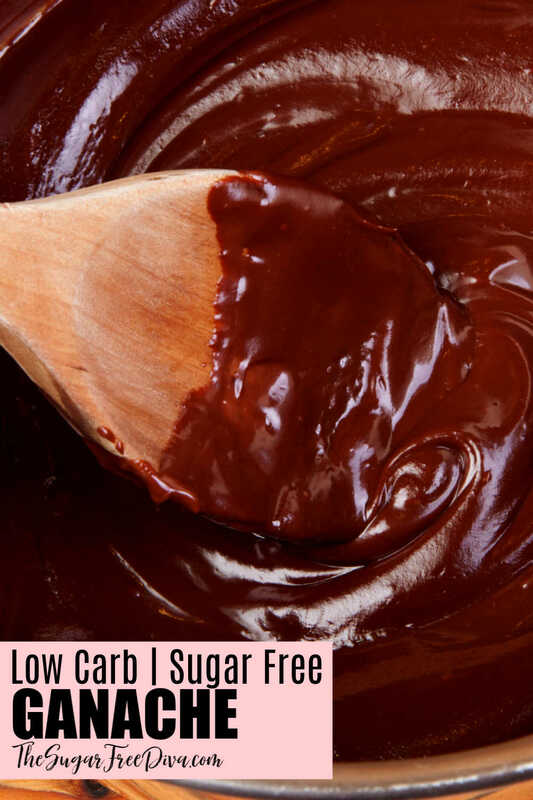 However, adding a bit of flavoring can also help make your sugar free ganache even better as well! Sugar Free Chocolate Cream Cheese Frosting. 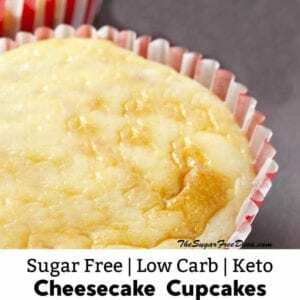 How To Make Sugar Free White Chocolate. And, Sugar Free Chocolate Hard Shell Topping. As mentioned, you will need Sugar Free Semi Sweet Chocolate Chips in this recipe. Sugar Free Semi Sweet Chocolate chips have that great chocolate taste but, with a bit of sweetness added to the recipe. Another important ingredient in Sugar Free Ganache is the heavy cream. Give your ganache a ‘kick’ by adding a teaspoon of instant coffee granules. Better yet, add a teaspoon (or up to a tablespoon) of your favorite liquor or extract (vanilla, orange, mint, etc.). Heavy or Heavy Whipping Cream- 1/2 cup. Use less for a thicker ganache result and use more for cream to make a thinner ganache result. Sugar Free Semi Sweet Chocolate Chips– 1 eight ounce bag. However, Sugar Free Dark Chocolate Chips can be used for a deeper and less sweet taste. As can unsweetened chocolate chips however, you may want to add a sweetener and/or some other kind of flavoring to enhance it. Optional- as mentioned earlier, you can easily give your ganache a ‘kick’ by adding a teaspoon of instant coffee granules. There are three methods to make this recipe. You can use a microwave, double boiler or a heavy skillet. Start by placing the chocolate chips into a bowl. Place the heavy cream in the microwave, using a microwave safe bowl. Heat the cream until it begins to bubble or steam, stopping to stir every 15-20 seconds. Carefully pour the heated heavy cream over the chocolate chips and allow the cream to melt the chips (3-5 minutes). 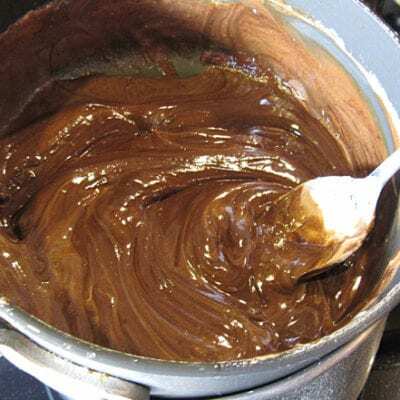 Blend or whisk the ganache, adding any additional flavoring, until the ingredients are well blended. Bring your cream to a boil in a heavy saucepan, stirring as necessary. Once the cream begins to boil you can remove it from the heat and stir in the chocolate chips. Add any additional flavorings as desired. Bring the bottom of the boiler to a simmer. Combine the ingredients in the top portion of the boiler until blended and smooth. It is easy to make and delicious to eat. 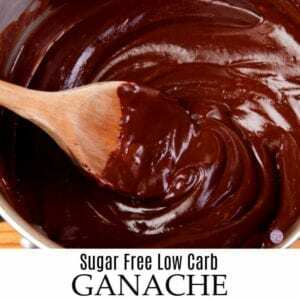 This is the recipe for How To Make Sugar Free Ganache that you can eat alone or use with in another recipe. Double boiler method. Bring the bottom of the boiler to a simmer.Combine the ingredients in the top portion of the boiler until blended and smooth. 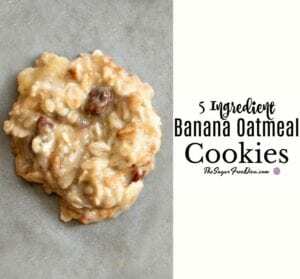 Please see post for details on this recipe. There are also other methods for making this ganache recipe as well. 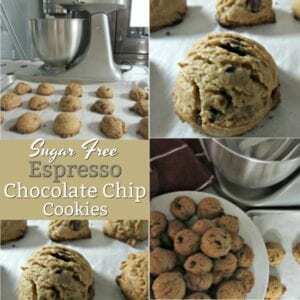 Sugar Free Dark Chocolate Chips can be used for a deeper and less sweet taste. As can unsweetened chocolate chips however, you may want to add a sweetener and/or some other kind of flavoring to enhance it. Optional- as mentioned earlier, you can easily give your ganache a 'kick' by adding a teaspoon of instant coffee granules.